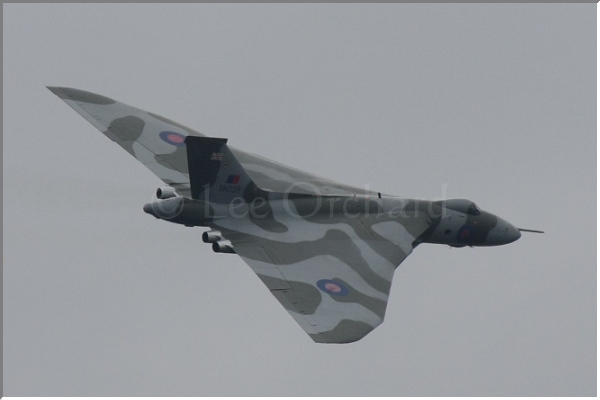 Anyone who follows the Vulcan would have known that today, sadly it was doing it’s final tour. The weather reflected the occasion, it was dull grey skies, no nice blue sky and clouds to be able to capture any final images of it against. We had had a busy morning with photo shoots and just happened to pop outside when I was reminded that the Vulcan was due to fly over Farnborough in 30 minutes time! 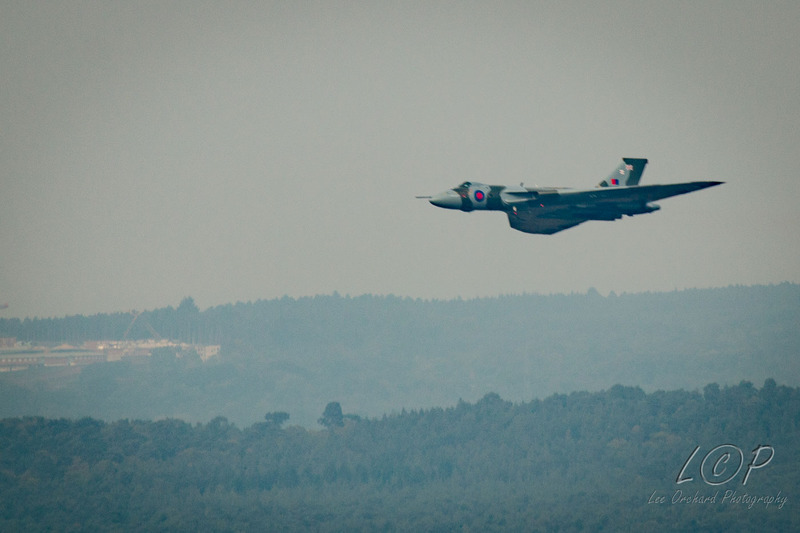 So I grabbed the camera, told the kids and we headed off on the walk up to the top of the hill over looking farnborough airport. Checking my watch as we were walking, it was getting close! We were a minute or so away, I checked twitter, the feed told me it was on time, but not exactly what time! 100 yards from the edge of the hill, someone shouted, there it is! I ran the rest of the distance, with the Kids, pointing it out to them and raised the camera! 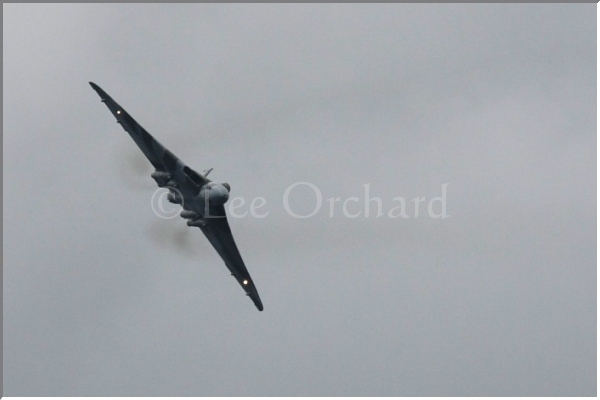 Ok, deep breath, check the camera setting again, raise it, re-locate the Vulcan in the view finder and shoot again! Better, great shot of it as it waggles its giant wings in acknowledgment to everyone watching. Now its along side and starting to move away. Moving away now, it starts to flying into the distance and with it comes the relization that this is the last time you will see it flying. Keep shooting. Even with the large lens this impressive graceful monster of an aircraft is now looking small. The tremendous exhust fumes and heat, now making it more difficult to focus on the aircrart. 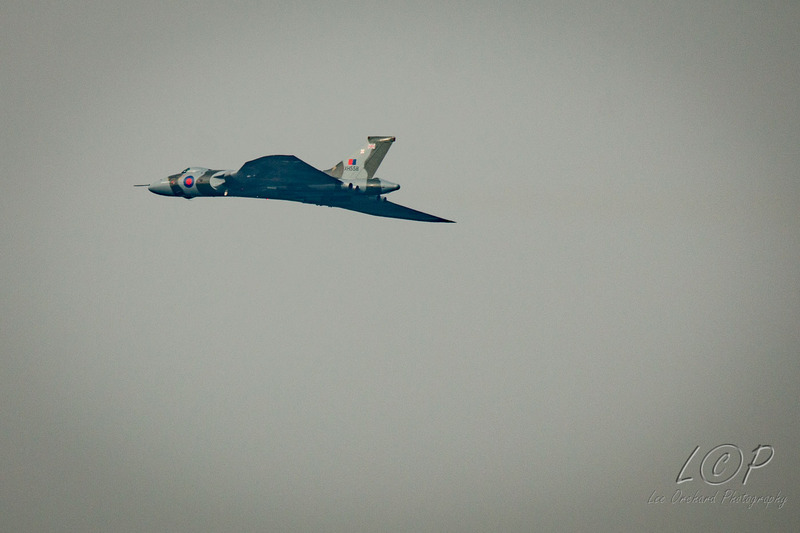 The last image, shows the Vulcan disappearing into the distance, back into history again. The flypast from first to last images was just 48 seconds! Another great aircraft now heading for the museum. 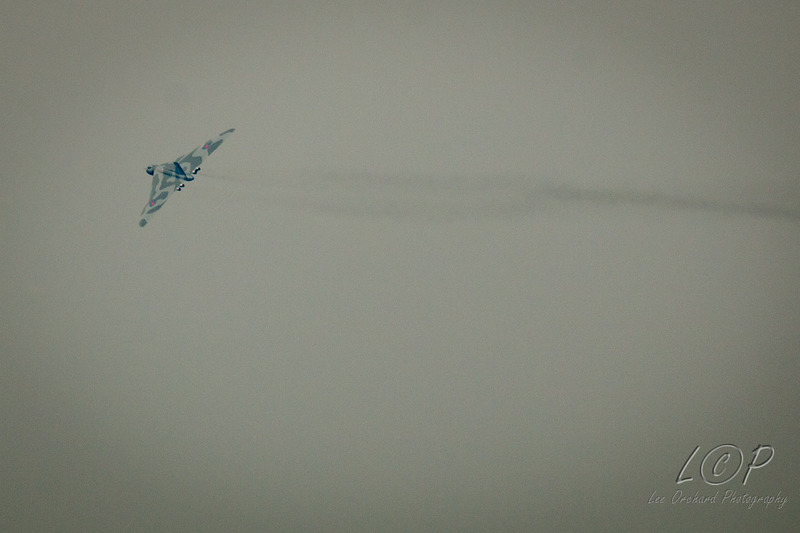 First Concorde, now the Vulcan. Unlike Concorde I’m pleased to have photographed this aircraft on a few occasions, its first show at Farnborough and now fittingly its last flight over Farnborough. 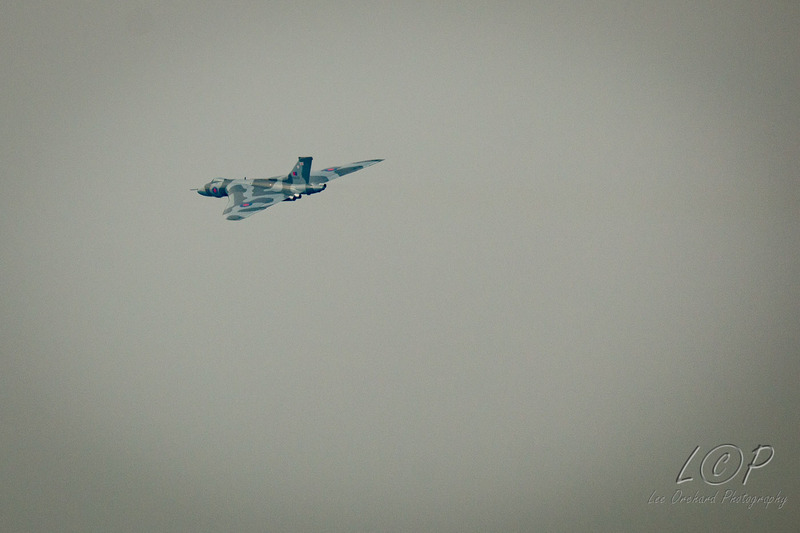 It was such a pull to airshows, its size was immense and only matched be its noise. 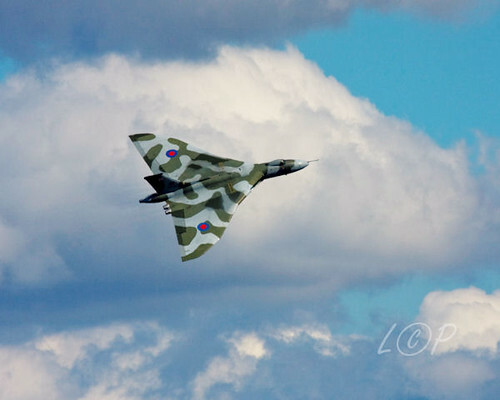 For aircraft lovers and airshows enthusiasts it will be surely missed and I will miss seeing it too. 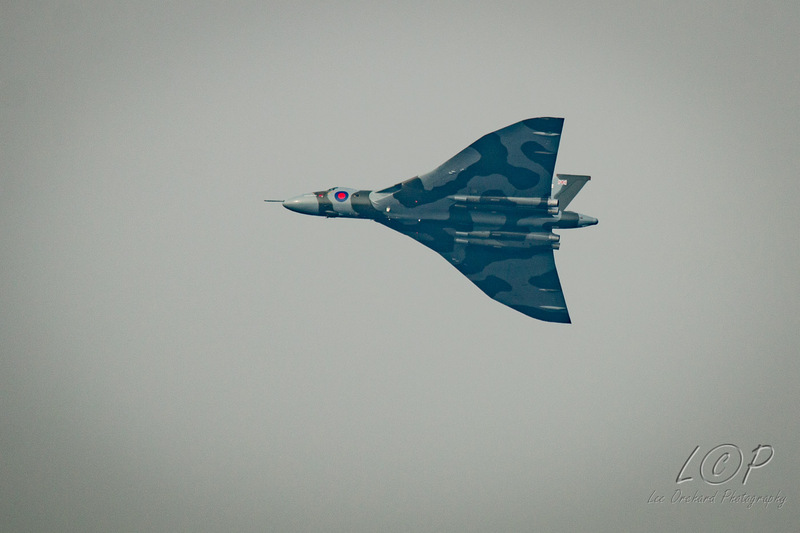 The future of the Vulcan is again on a knife edge. They are 100k short of their target. It would be a shame if this magnificent aircraft went the way of Concorde. 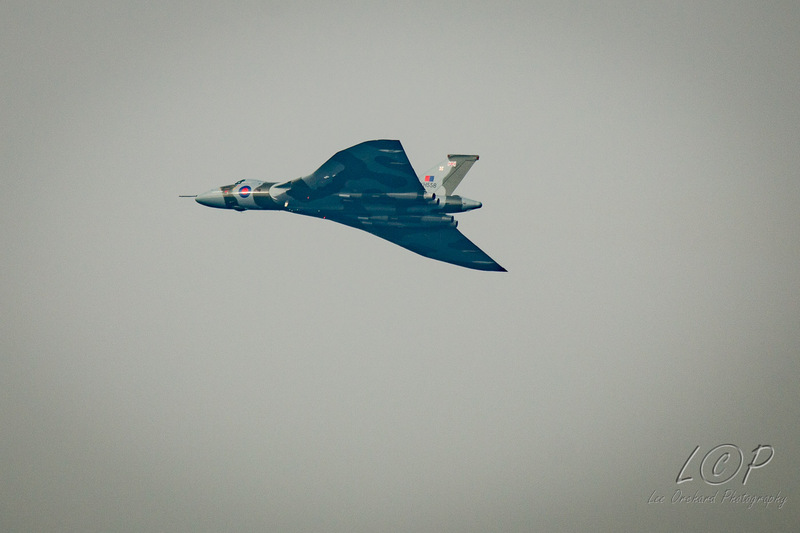 Farnborough Airshow 08 – The Vulcan! The last couple of weeks we have been battling with the Farnborough Airshow traffic. Living close to Farnborough means that for 2 weeks every 2 years temporary lights and diversions appear around Farnborough and the surrounding areas. This makes it difficult to get to work, and very difficult if you want to go out on the weekend of the show, unless you are heading in the opposite direction! The plus side of all of this, is that in the buildup week, we get the aircraft flying across the works multi-storey car park and so it is a great place to stand to see some of the aircraft. In some displays, you get the aircraft flying directly over your head down the centre of the car park, at what feels like just a few metres above you! This week the Vulcan was flying, so we all wanted to see what path if would take. After its initial take-off and disappear it started its display. Being so high we could see it flying down the runway, then starting to turn, and turn towards us. It continued its turn and banked right above our heads providing a great underside shot, At one point it was actually too close for the lens. Sadly the week leading up to the show wasn’t ideal weather so in some shots it looked really dull is it was still raining, but, I still get some interesting pictures of it! Click to see other aircraft photos.